A mortgage rate lock can be an important tool for homebuyers. Basically, a mortgage rate lock is an arrangement between a lender and a borrower in which a mortgage’s interest rate is locked for a certain period of time. Typically, the locked-in rate will be the current market interest rate. Some lenders choose to charge borrowers a lock fee if they choose to lock in the interest rate. Also, it’s common for lenders to start at a higher rate in case the homebuyers do not exercise their options to lock in a rate. When a borrower and lender agree to a mortgage rate lock, it is important that both parties are bound by the agreement. This agreement would mean, for example, that the borrower could not unlock the rate because the market interest rate had lowered. 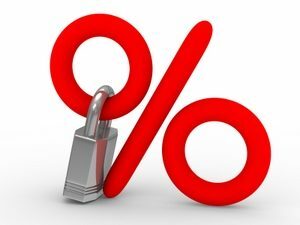 Interest rates will usually be locked from the moment that the mortgage is offered until it is closed. Unless a change occurs to the loan application, the interest rate will stay the same and will not be affected by market changes. Changes to the mortgage application, such as an increased loan amount or an updated credit score for the borrower, can result in the interest rate changing. Interest rates can also change if the home is appraised at a higher or lower amount than expected, or the borrower changes the type of mortgage for which they are applying. Mortgage rate locks have some drawbacks from the borrower’s standpoint. For example, if the market rate falls during the term of the mortgage, a borrower would not be able to take advantage of these lower rates. The same would be true for lenders if the market rate rises. A lock deposit can be a good way to make sure that both the borrower and the lender hold to the terms of the mortgage lock agreement. This deposit shows that both parties are committed to upholding the agreement. A loan estimate and a rate lock can be issued at the same time, and the period of the mortgage rate lock can be between 10 and 60 days. A longer rate lock period typically means that the borrower and lender have agreed to a higher interest rate.